I had to make a zipper pouch for the January swap for the Modern Quilt Guild, and I decided I would make two. I made this pretty little zipper wristlet for a friend of mine for Christmas. I just love the colors and the metallic in the fabric. I found the tutorial for this pouch on Pinterest, and you can see it here. I bought the fabric in bundles at Hobby Lobby. I don't usually buy fabric this way, but I wanted 12 different fabrics that coordinated, and I had a coupon. When I saw these prints, I knew my friend would like them too. The jelly roll came with 10 prints. 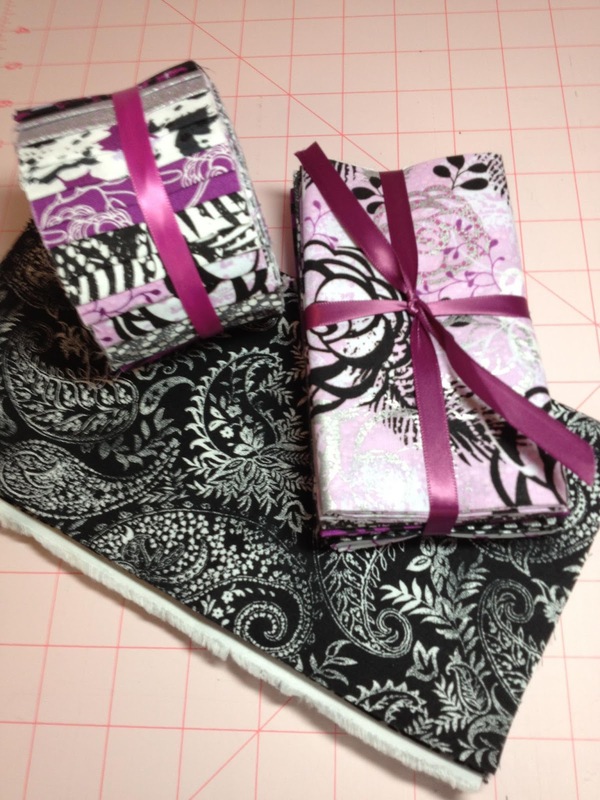 I had the black with white polka dot in the center and I bought a 1/4 yard of the black and white paisley (top right corner). I also bought another bundle of larger pieces of coordinating fabric for the lining and pockets inside. I will definitely make this pattern again. They make such cute gifts (I'm thinking teacher gifts at the end of this school year). But next time I won't trim the quilted portion until I finish the lining, and I will trim them together to make sure they are exactly the same size. My quilted side turned out quite a bit smaller than the lining because the fabric pulled up during quilting. Also, I will shorten the strap about a 1/2 inch. I accidentally sewed the end of the strap into the seam on the opposite side BOTH times I made this pouch. I really liked the instructions she provided for sewing a zipper. This was my first attempt at a zipper, and following her instructions worked like a charm! I'm not scared of them any more! I added the charm to this one because my friend really likes peacocks, and I thought it gave it a little something extra. Thanks! I'm really pleased with how they turned out. I can't wait to make another one. Thanks for linking up at Submarine Sunday last week. I featured you wristlet at this week's party. Come on over and grab a featured button, and feel free to link up again soon!